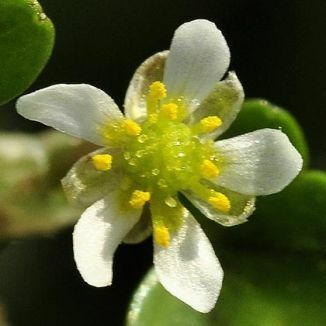 Creeping on mud, floating over and carpeting shallow water and drainage ditches, this is an annual or perennial which shows its dainty white flowers (4-8mm across) from May to August. With five narrow petals and sepals – the latter almost as long as the former - the centre of the flower has many bright yellow stamens. The leaves are shallowly 5-lobed with little dark splotches at their centres. 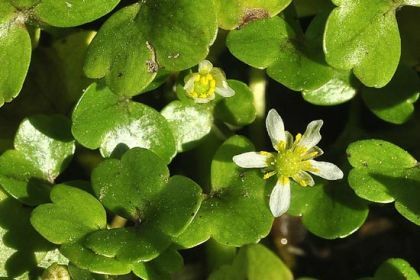 Ivy-leaved Crowfoot is a native plant and it belongs to the Ranunculaceae family. I first recorded this wildflower at Tacumshin, Co Wexford in 2009 and photographed it at that time. This little plant is not commonly found in the centre of Ireland and rarely on limestone.